Workforce development needs to be a national priority, said A3’s Jeff Burnstein and Bob Doyle. Automation can help multiple industries and workers, they said. 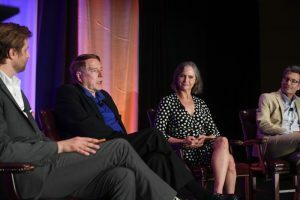 SANTA CLARA, Calif. — One of the biggest challenges for the global robotics industry is explaining that workforce development and the adoption of robots aren’t in opposition, said several speakers at last week’s RoboBusiness conference here. Executives at the Association for Advancing Automation (A3) spoke with Robotics Business Review about how their organizations are growing, the importance of workforce development, and how events such as RoboBusiness and the Collaborative Robots, Advanced Vision & AI Conference can help the industry. A3 is the parent organization of the Robotic Industries Association (RIA), AIA — Advancing Vision + Imaging, the Motion Control and Motors Association (MCMA), and A3 Mexico. Automation is growing across industries, notes A3 President Jeff Burnstein. “I like seeing new technologies that are on the exhibit floor, and the topics and speakers,” Doyle said. Last month, the RIA announced a partnership with MassRobotics, an organization devoted to helping companies in Massachusetts, a leading U.S. hub for automation development and commercialization. To encourage the growth of global robotics, A3 also has a strong relationship with the International Federation of Robotics (IFR). The RIA’s Robotic Integrator Certification Program has grown to Mexico, Central America, Switzerland, and other companies in Europe. As for reshoring, Burnstein disputed recent claims that automation hasn’t yet contributed to moving manufacturing back to the U.S. “Anecdotally, we’re seeing a lot of reshoring thanks to robotics,” he said. “In order for any business to compete in the global marketplace, automation is imperative, especially if you’re bringing business back, starting fresh, or just growing a business in the U.S.,” Doyle asserted. Panelists at the closing session at RoboBusiness 2018 conference discuss workforce issues around robotics. Burnstein cited RAMTEC (the Robotics Advanced Manufacturing Technology Education Collaborative) in Ohio as an example of a successful workforce development program. The next event for A3 is the Collaborative Robots, Advanced Vision & AI Conference (CRAV.ai), which will be from Oct. 24 to 25, 2018, in Santa Clara, Calif.
“It’s a great two days of learning, and we’re trying to reach end users to help them understand robotics, vision, and AI,” he said.